The Eden Mission - Cornwall The Eden Project Mission is to “Promote the understanding and responsible management of the vital relationship between plants, people and resources, leading towards a sustainable future for all.” Sowing the seeds of change The Eden Project is working with others towards the understanding and implementation of the principles of Agenda 21, the framework for sustainable development. The living theatre of plants and people The Eden Project is a gateway into the world of plants and people. A meeting place for all to discover how we depend on plants and how we can help to manage and conserve them for our mutual survival. The Eden Project is an international visitor destination, a showcase, a centre for communication, education participation, a new scientific institute and forum for the 21st century. 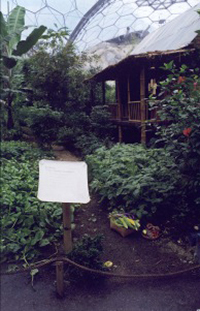 Special Themes At the Eden Project, visitors also have opportunities to participate in trails to link personal interests to the stories eg plants and music, plants and health, plants and sport, plants and art etc. There will be themed events from tea tasting to chocolate days and "hands on" workshops from performance arts to horticulture, and from cooking to dyeing etc.